Answering a little "Captcha" will reveal my address for you. 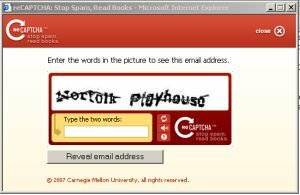 Sadly, to defeat the mongrel scourge of spam harvesters or bots filling in forms I've had to adopt this procedure called reCAPTCHA which is becoming more and more popular to protect forms or sign up email addresses from robot harvesters. The contact email address is partially revealed to you below. b) then click send in your mail program. Simple as that!